catering for all your transportation needs including weddings to special events and ocassions, point-to-point lunch & dinner transfers, tours, corporate & leisure, photo shoots, films & commerCIAls. 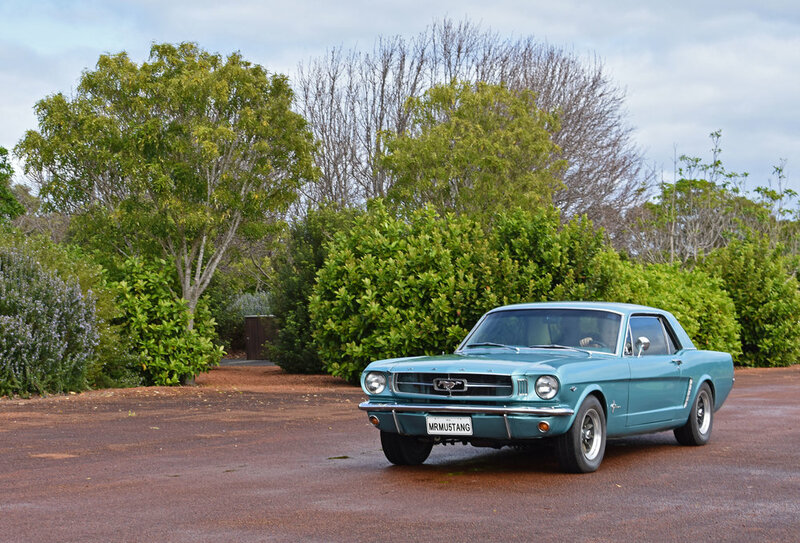 We present to you Australia’s South West premier example of the legendary 1960’s Ford Mustang muscle car. Our car, we affectionately named Sally or Sal for short (yes as in Mustang Sally) is a 1965 Mustang two door, five seat hardtop coupe. Powered by the world’s best sounding 289 V8', she has a beautiful Tahoe Turquiose Metallic paintwork with a white interior. Mustang Sally was first licenced in Houston out of the Dearborn factory in 1965. Sally has been diligently maintained throughout her life, to the highest of standards without compromising her originality which includes original dash and instrument panel, so she still retains that special “something”. One of the original factory options fitted to the car was air-conditioning and we are pleased to say that this remains in fine working order, so you will still be transported in refreshing cool air in a very cool-looking car! And of course she is left-hand drive! We are licensed to carry four (4) passengers, as this is a cozy fit however we recommend three (3) passengers. Sally still retains the original seat lap belts (working) front and rear and is not fitted with airbags; it is therefore not suitable for carriage of children under the age of 12 or less. If you are looking for a WOW factor, then Mr Mustang Hire’s 1965 Mustang will supply it in spades and ensure to make your experience one you’ll never forget. Mr Mustang was my ride of choice for my big day, my 60th, a beautiful and immaculate car, and a chauffeur with a clear sense of care and safe driving. It was nice to be able to relax and enjoy the ride. The initial ride was to the Colourpatch Cafe in Augusta for lunch, then to the Lighthouse, Waterwheel and around before heading home. Fabulous day, and a fabulous ride. There’s nothing like a grand car, and the smooth growl of that engine.